Early last year the Honourable Navdeep Bains, the Minister of Innovation, Science and Economic Development, announced a legislative review of the Telecommunications Act, the Radiocommunication Act and the Broadcasting Act. Minister Bains then formed a panel to conduct the review based on terms of reference set by the Minister. This is a major and timely policy reevaluation process. The three acts govern the telecom and broadcasting industries in Canada, industries which generate nearly $45 billion in revenues per year from Canadian households, for services including home internet, wireless services, home telephone, mobile phones, television and radio. The review process included a request for comments and written submissions from interested parties, which were to be published after the deadline for submissions of January 11, 2019. VMedia, along with about 2000 other parties, accepted the opportunity to submit its ideas and proposals. VMedia’s submission can be read here. 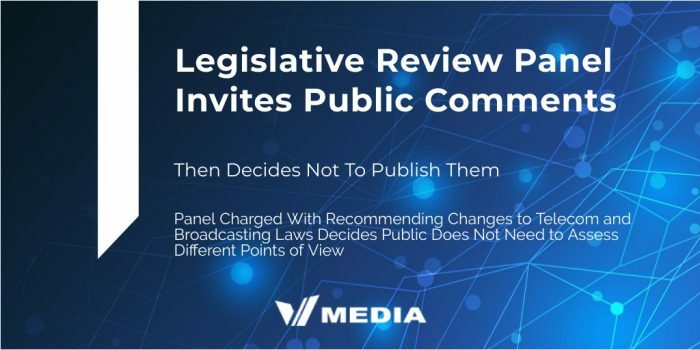 On January 14, the panel’s website announced that the panel would review the comments, evaluate them, and prepare a “What We’ve Heard” report by June 30, 2019. Unfortunately, it was also announced that only then, six months from now, will the submissions be made available to the public and posted to the panel’s website. Until then they will be available only to the panel. This is disappointing. Failure to post the submissions is a missed opportunity to let the public assess varied points of view, make all the submitted ideas accessible in the public square, and let Canadians engage in debate over these crucial issues over the next six months leading up to the release of the report. The industry has a tremendous impact on the lives of all Canadians, and any opportunity to let Canadians better understand what the issues are, how Canada ranks among other developed nations in technology, innovation and cost of services, and what other approaches may be taken in the way Canadians are served, is an opportunity that should not be missed. The ability of Canadians to access those submissions is just such a major opportunity. The government has many times expressed its support for transparency, diversity and evidence-based decision making. A legislative review process affecting a $45 billion industry, dominated by just three players across Canada, which are the gatekeepers for services that increasingly touch on almost every aspect of our lives and reap so much of our hard-earned wages, deserves nothing less. VMedia asks that the submissions be published now to allow Canadians to participate in this important conversation.